Pan fried fillet of sea bass served with mustard flavoured crushed potatoes, roasted fennel and a buttery sauce full of mussels. 1. FOR THE FISH AND SHELLFISH. Prepare the sea bass by removing the pin bones with fish tweezers. Scrape off any scales on the skin side and then score the skin three times. Prepare the mussels by removing any beards and then check any open mussels are alive by giving them a gentle tap. If they close, they are alive and are safe to eat. Discard any that do not open. Wash the mussels under running water to remove any grit and dirt. Place the mussels in a saucepan with a splash of water and cook with the lid on over a high heat for 3 minutes until they are all fully open. Discard any mussels that remain closed. Keep to one side to use later in the sauce. Place the potatoes in a pan of salted water and bring to the boil. When the potatoes are boiling, reduce the heat and cook slowly until the potatoes are tender. Pick the leaves from the parsley and finely chop. When the potatoes are cooked, drain and place in a bowl with the Maldon sea salt, parsley and mustard. Crush the potatoes with a fork and mix in the olive oil. Check the seasoning. For the fennel: Cut the fennel in half lengthways. Remove the tough core and then cut each half of fennel into 4 pieces. Heat a frying pan until hot and add the olive oil. Add the fennel and cook until it is nicely coloured and caramelised. Season the fennel with Maldon sea salt, transfer to a baking tray and cook in the oven for 15 minutes until cooked through. When cooked squeeze on some lemon juice and keep warm until ready to serve. Finely dice the shallot and crush the garlic clove. Place the shallots, garlic and thyme in a saucepan with the white wine and white wine vinegar. Bring to the boil and then reduce the liquid to about 30ml. Pass this through a fine sieve and keep the liquid. Cut the butter into small cubes. Pick the leaves from the tarragon and roughly chop. To make the sauce: Bring the liquid to the boil in a small sauce pan. Reduce the heat and start to whisk in the butter one cube at a time. Whisk continuously until all of the butter has been incorporated. Check the seasoning; add a squeeze of lemon juice and the tarragon leaves. Just before serving, gently re-heat the sauce and add the mussels, ensuring they are hot before serving. Heat a frying pan until very hot and add the sunflower oil. Season the sea bass with Maldon sea salt on both sides and then add the fish carefully to the pan, skin side down. Cook the fish on the skin side until the skin is golden brown and then transfer to the oven for 3 minutes to finish cooking. Whilst the fish is cooking, start to assemble the dish. Re-heat the potatoes and the fennel. Warm the sauce. Place a stainless steel ring in the centre of the plate and fill with the potatoes. 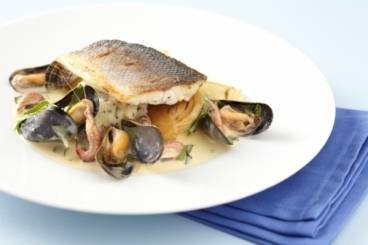 Place the sea bass fillet on top, arrange the fennel on top of the fish and then finish the plate with the shellfish beurre blanc.